The church and Christian ministries today are, in a sense, more powerful, influential and wealthy than ever before. Our pastors are better educated, technology & media tools abound, staff & outreach capacity surpasses any time in history. Have you ever wondered why, despite this, Christianity doesn’t have an unprecedented impact or even seem to make much of a difference? Clearly the church has yet to become a model for society let alone reach its redemptive potential. Precious Clay Ministries exists as a resource to the church, advancing the kingdom of God through Christ-centered leadership. As individuals we are prone to become comfortably numb and even complacent. God has uniquely formed each of us in his image and yet this has been severely marred. His purpose in redeeming us is to make us more like Jesus. He intends to accomplish his purposes by revealing his ‘manifold wisdom’ through the church. Often we struggle understanding God’s will for our lives while actually he has already made that clear; he has given us all that we need to become all we can be ‘in Him’. So why do we resist the Master Potter’s work in us and through us? Life’s inevitable challenges, difficulties and suffering can seem scary and painful; yet ironically it is exactly what brings genuine peace and fulfillment when we reframe our present reality from God’s perspective. 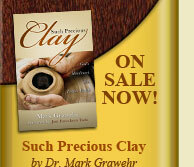 Understanding and embracing the Biblical Worldview is essential to yeilding faithfully to the Master Potter’s hands. Christianity is more than a belief system whereby we ascend to a saving ‘knowledge’ to gain access to heaven. Faith is an action that involves surrendered obedience, as God intended apart from the patterns of this world, by the power of his spirit. Precious Clay Ministries is committed to proclaiming the transforming power of the gospel to mold and shape us into Christlikeness.